There is so much going on at your library! Did you know that in the last year, people did 15.5 million searches in the WCCLS catalog? Or that 285,906 people attended youth programs? Or that people conducted 492,699 online research sessions? Or that 128,434 volunteer hours were donated to the libraries? 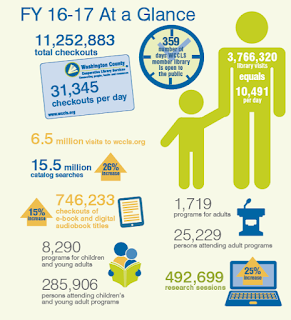 Find out more fun facts in the At-a-Glance infographic, and delve into how WCCLS is improving people's lives in the WCCLS 2016-2017 Year in Review.